Light pollution is the name given for the “excess or obtrusive light created by humans.” It is noticeable particularly in urban areas and has expanded to suburban American over the past 50 years. My son and I were talking about this recently after he returned from Young Life camp in Rockbridge, Virginia. 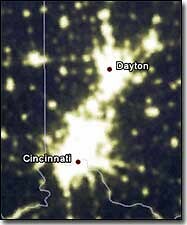 His comment was “its amazing how bright the stars were.” How much “light pollution” has crept into the area between Cincinnati and Dayton? More than I thought. 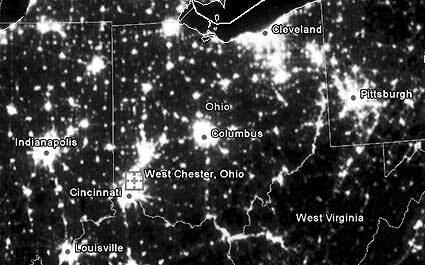 Light pollution is a side effect of industrial civilization. Its sources include building exterior and interior lighting, advertising, commercial properties, offices, factories, streetlights, and illuminated sporting venues. It is most severe in highly industrialized, densely populated areas of North America, Europe, and Japan and in major cities in the Middle East like Cairo, but even relatively small amounts of light can be noticed and create problems. Like other forms of pollution, such as air, water and noise pollution, light pollution causes damage to the environment.